Start in Waynesville, NC and take hwy 23 south to hwy 107 south. 107 is really pretty and fairly easy until you get near the lake. When you get to Cashiers, to east on 64 thru Sapphire to hwy 281 S. Go south on 281 about 7 miles to Whitewater Falls. 20 min hike, well worth it. Get back to 64 and go east again to Toxaway Falls (look for the restaurant I mention above - just before the bridge). Pretty twisty past Toxaway to Brevard, then take US 276 N to Sliding Rock (signs). Continue on past sliding rock and head all the way up to the route's end at Maggie Valley. You'll be traveling through the beautiful Nantahala National Forest known for it's deep mountain gorges and valleys . The lake off Route 107 is gorgeous! Whitewater Falls off Route 281 is worth the 20 minute hike to see it. Stop and wear your swimsuit and slide down Sliding Rock off 276. If you want twisties, you've found the right post! Hwy 276 is one of most twisty roads I've ever been on ... it's a mini-dragon. All of these hwy's are great ... no issues or problems. Photo contributed by visitor in May 09: "This is a picture of Linville Falls which is just off the blue ridge near Spruce Pine!" Gas up in Waynesville, Cashiers, or Brevard. Lots of restaurants in Brevard and Waynesville. Heading east into Toxaway Falls, just before the bridge you will find a restaurant w/a paved which is a nice place for lunch. Sunday had live bluegrass music. Also, there is a type of zoo if you will off 276 that is free on Tuesdays. Stop to see Sliding Rock off 276 and bring your swimsuit to slide down Sliding Rock. As you finish up the loop, you will make your way back to Waynesville and Maggie Valley. Here I recommend Legends bar in Maggie valley. If you like old motorcycles, go thru the Wheels Thru Time Motorcycle Museum, well worth the $12 admission! Heading east into Toxaway Falls, just before the bridge you will find a restaurant w/a paved which is a nice place for lunch. 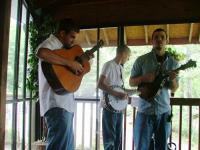 Sunday had live bluegrass music. on January 25, 2010 2 out of 2 members found this review useful. on July 21, 2015 1 out of 1 members found this review useful. I rode 64 west from Hendersonville to 178, where I turned south. The road was filled with lots of cars and overall not an enjoyable ride. The rest of the loop described in this specific map may offer great riding, but if you're looking for roads with nice turns, little traffic and not too many towns to go through, this piece of 64 should be skipped. That being said, 64 from Hayesville (where 175 meets it from the south) to Franklin is a great, amazing ride. Great ability to open up the throttle and lean into wide turns. on October 3, 2009 1 out of 2 members found this review useful. on August 20, 2009 1 out of 2 members found this review useful. on June 7, 2009 1 out of 1 members found this review useful. Wheels Through Time seems to still be in NC based on their webpage info. No mention of a move that I can see. For the past several weeks, we've been working on a host of special events at the museum for this upcoming season. The first of these events -- The SmokeOut Long Road Stop at Wheels Through Time, will be held on Thursday, May 14, 2009.
on February 26, 2009 1 out of 5 members found this review useful. Wheels through Time is gone! Moved to AZ! Too bad! Great place! See you out west Dale!! I rode 107 south from 74. I didn't do the route as described in this map though, I stayed on 107 all the way south until it intersects with 28 in South Carolina (where I turned back up north on 28). The road quality was great. The ride was great with good curves and not a lot of traffic. It really becomes good after you pass west carolina university.